The probate terms listed in this glossary are designed to provide a general understanding of terms used in probate. Words often take on different meanings depending on the context used. For more precise definitions you should consult with a probate attorney and/or refer to California Probate Code § 20, et. seq. Administrator: A person appointed by the Probate Court to administer the Estate of a person who died intestate, or without a Will. Administrator with Will Annexed: This person is appointed by the Probate Court but is not the person who was named in the Will to act as the Executor. This court appointed representative administers the Estate of the decedent who died with a Will, under the Independent Administration of Estates Act (IAEA). Affidavit: A written affirmation or statement made under penalty of perjury and notarized. Ancillary Administration: The administration of property owned by a decedent located in a state other than the domicile of the decedent. Beneficiary: A Beneficiary may be an individual person or organization to whom a gift is made via a Will and who inherits the gifted property. The property may be personal property, real property, or both. Blocked Accounts: The creation of a bank or other account by court order; a court order is required to withdraw and deposit funds. Certified Probate Real Estate Specialist: A licensed real estate agent or broker with specialized training and certified in probate real estate. Codicil: A Codicil is a written supplement, or amendment, to an existing Will. Community Property: In California, any property acquired by a husband and wife during a valid marriage. Conservatee: A person whom the court determines to be unable to manage their own personal and/or financial affairs. Conservator: The court appoints a person or organization to manage and protect the financial and/or personal care of a conservatee. Conservatorship: There are different types of conservatorship. A probate conservatorship could be for the person or the estate. Decedent: The deceased, or person who passed away. Declaration: A written statement made under penalty of perjury. Devisee: A person named in a Will to receive a gift of Real Property from the Decedent. Disclaimer: An irrevocable refusal by an individual to accept ownership of the property after an individual’s death. Domicile: A permanent place of residence. Escheat: When a person who dies without a Will and has no surviving heirs, the property reverts, or escheats to the state. Estate: An Estate is comprised of a person’s total assets or possessions. This includes personal possessions such as automobiles, clothing, jewelry, as well as cash, securities, and real property. The Estate assets are managed by the Fiduciary and subject to court order. Executor: The Executor is the person who the deceased person named in their Will to carry out the wishes outlined in the Will. The Executor is also known as the Personal Representative (PR) of the decedent’s Estate. Ex Parte: A judicial proceeding which is granted without notice. Federal Estate Taxes: Death taxes imposed by the federal government on the transfer of assets following one’s death. Fiduciary: A person or an organization that has a legal responsibility that involves a high standard of care to manage the property for a person. Grantor: An individual or corporation who transfers (grants) property to another person. Guardian: A person who manages and protects the financial and/or personal care of a minor, or ward. A guardian is appointed by the probate court. Heir: An Heir is a person who inherits property via a Will or who inherits property from a person who died without a Will. Holographic Will: A Holographic Will is a handwritten Will that is written, dated and signed by the person who wrote the Will. Independent Administration of Estates Act (IAEA): The IAEA allows the Personal Representative to administer most aspects of a decedent’s Estate without court supervision. Inter Vivos Trust: A trust that allows for the distribution of property or money to another person or organization during the lifetime of a person. This is distinguished from a trust that transfers money or property after death. Intestate: When someone dies without a Will, they have died intestate. Intestate Succession: The order in which people inherit assets from people who died intestate, or without a Will. Irrevocable Trust: The grantor expressly releases the power to revoke the trust. Joint Tenancy: Property owned jointly by two or more persons. Legatee: A person named in a Will to receive a gift of Personal Property from the Decedent. Letters of Administration: Letters of Administration are granted by the judge, to the administrator of an Estate, as part of the Probate Process. Letters Testamentary: An Executor of a Will is granted “Letters Testamentary” by the judge as part of the Probate Process. Life Estate: An interest in property that lasts only for the life of the owner, or holder. Life Tenant: A tenant who may retain possession of the property as long as they are alive. Limited Conservatorship: Generally, for developmentally disabled adults. LPS Conservatorship: For adults with mental illnesses that are listed in the DSM or Diagnostic and Statistical Manual of Mental Disorders. Bi-Polar disorder and schizophrenia are examples of such mental illnesses. Minor: A person under 18 years of age under the care of a court-appointed guardian. This is in the context of a guardianship. Personal Property: Personal Property generally constitutes all Property that is not real and moveable. Personal Representative: A Personal Representative, often referred to as a “PR” is the person who manages the distribution of the assets of an Estate. A Personal Representative may be an Executor or Administrator, appointed by the Probate Court. Petition: A Petition is a legal document filed with the court. The Petition represents a formal, written request to the court for a specific action or order. For example, the Petition for Probate. Pretermitted Heir: A person who would normally be a beneficiary but is not mentioned in the Will. Probate: Probate is a court-supervised (legal) process to administer an estate. Probate Attorney: An attorney with specialized knowledge, and experience, with probate matters. Probate Administration: The legal process in which the probate court supervises the collection of a decedent’s debts and taxes and orders property distributed in accordance with a Will. Probate Court: The court that handles Probate matters, such as Wills, Trusts, Guardianships, and Conservatorships. Probate Process: The steps taken to distribute an estate under the supervision of the Probate Court. Probate Timeline: The average period of time it takes to complete the Probate Process. Property: Anything that can be owned is referred to as Property. There is a distinction between Real Property and Personal Property. Real Property: Real Property is generally property that is not personal and immovable. Residue: The remaining portion of a decedent’s estate after the payments of debts and legacies. Residuary Beneficiary: A person who receives all or part of the Residue. Revocable Trust: A trust that may be revoked by the person who makes the trust. Small Estates: An estate of a decedent may avoid probate and personal property may be transferred directly to an heir if the requirements of California Probate Code §13100 et seq. are met. Successor Fiduciary: The next person, or organization appointed if a person or organization named or appointed as Fiduciary cannot act due to resignation, removal or death. Tenancy in Common: A form of holding title to the real or personal property by two or more persons with no right of survivorship. Testate: When someone dies with a valid Will, they have died testate. Testator: Testator is a person who makes a Will. Testamentary Trust: A trust created by a Will that does not go into effect until the person who makes the trust dies. Trusts: Property handed over to a person and held for the benefit of another person. The property is held in trust. Trustee: A person who holds and manages the property for the benefit of a beneficiary. The person or organization is authorized as trustee via a trust. A trustee is also a Fiduciary. Trustor: A person who establishes a trust. Will: A Will, also known as a Last Will and Testament, is a written legal document that dictates the disposition of the decedent’s assets after death. A Will is filed with the Probate Court after a person dies as part of the Probate Process. 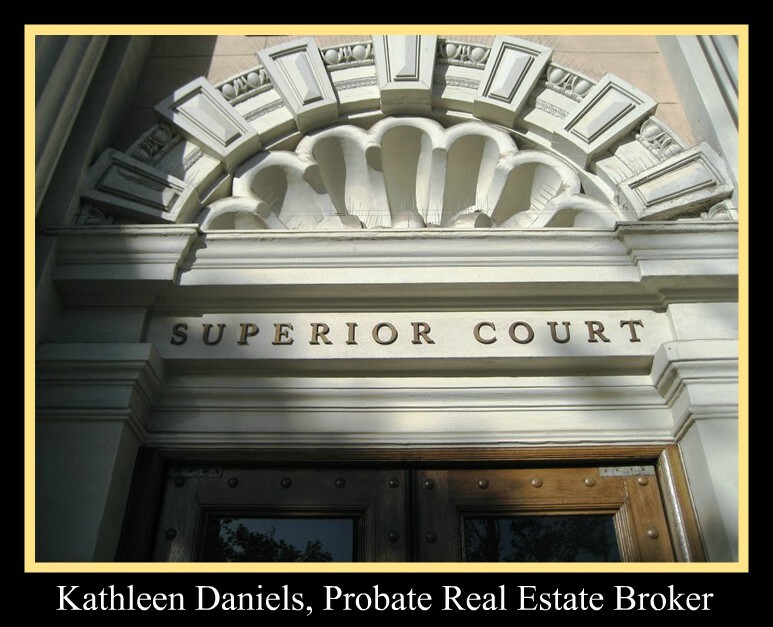 If you need help with probate real estate contact Kathleen Daniels, Independent Broker-Owner of KD Realty in San Jose. 408-972-1822. Kathleen is a Certified Probate Real Specialist and certified in Professional Fiduciary Management for Trustees. If you need help finding a probate attorney, we can help. We work with many of the top probate attorneys in Silicon Valley. Just like real estate agents, all attorneys are not created equal. Probate is stressful. You want to work with a probate agent and attorney and know your needs are being met.